This film seems to divide opinion. A good friend of mine whose opinions and film witterings I really appreciate (Vic Thiessen) writes on his blog's review of this film about the main thing that bothers him: "the utter lack of originality and imagination, resulting in an overwhelming sense of boredom". Perhaps the UK release was a totally different film, but in the version I saw, for me the thing that made it fly was the way in which it took me back 40 years to look into the future. Edge of the seat stuff for most of its 133 minutes - and that from a film with (mostly) new characters. Yes there was lots of mindless action, explosions, shootings and crashes but this is a war film after all. For me this film could have been made in the 1970s, have been locked away in George Lucas' private film vault and released as a gift for Christmas 2016. 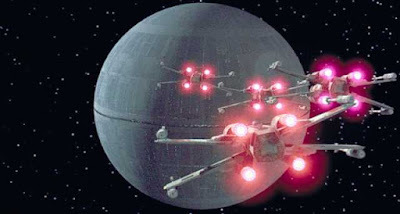 Obviously the production techniques have moved on quite a bit since the original, but the worlds created in the film have such a familiar feel about them, the dualism of the Dark Side of the Empire against the good people of the Rebellion, Tie Fighters and X-Wings all made it feel like a luxuriating nostalgic indulgence. I didn't mind being duped - that is after all what I paid the ticket price for. I won't go into the story except to say that it has a tremendously high level of continuity with the Star Wars universe that we know and love. It takes the opportunity to provide (invent?) some back story that helps make more sense of the original trilogies. It feels real - if that's not a silly thing to say and that is why so many have liked it. On iMDb it currently scores 8.1/10 and on Rotten Tomatoes 85% so it must have something going for it! It was good to see Felicity Jones performing strongly in a different kind of role as Jyn Erso. There were strong performances from many others - even Peter Cushing performs from beyond the grave to reprise his role as Grand Moff Tarkin. Any fears that the Disneyfication of the franchise would see it altered in a negative way are ill-founded now that we have two films to judge the new owners of the brand by. That is really good news as the production schedule has new films appearing at an appetising rate. This could have been a flop, it could have betrayed the original, it could have been a poor story - but none of these happened and it rightly deserves the accolades it has garnered. I really enjoyed it and look forward to adding it to my collection in due course. I'll give it 8/10 - almost a 9, but not quite.